Artists Comments: On my last of four miniature paintings, I really got into the scale and decided to focus on something that did not have an apparent focal point. 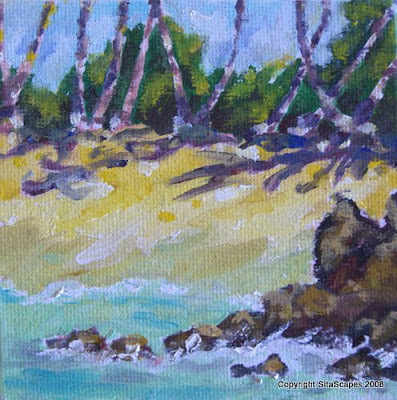 I saw a small patch of sand where it touched the shoreline and was inspired by the partial palm tree trunks and shadows reaching down the sandy banks. This was such a great lesson for me to help me focus on capturing the simplest of elements and making them into works of art. I loved the practice! Let's see how I do on my next project ~ my largest painting ever. Only time will tell!